Its just the first week of the year and Mercy Aigbe is already trending from different angles and the spotlight is on her. It all started when Mercy Aigbe released some really cute photos just before her birthday. In the photo, she is seen wearing a lovely red dress. 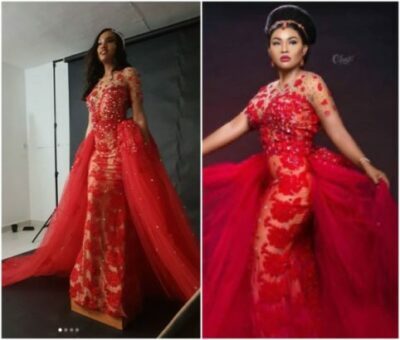 Just when fans were praising and admiring the outfit, a certain lady, Maryam Elishacame out to call out the designer of the dress. She claims to be the original owner of the dress, stating that she paid for it for her wedding only for the designer of the dress to stop picking her calls barely 24 hours to her wedding. She also said that the designer came up the story of the delivery man disappearing immediately after he was given the clothes to deliver.